This week’s Featured Onepager is a top-flight site! Old Sport Biplane Rides takes you back to the golden age of flying from its antique airfield in Ranger, Texas. When you think of flying these days, you might picture long security lines, fees for previously included checked baggage (don’t even get us started…), and the ever-shrinking seating situation—none of which exactly say “friendly skies.” But one look at Old Sport’s website will transport you back to the golden age of flying where the sky’s the limit. Air travel isn’t just transportation to your vacation—it’s part of it! 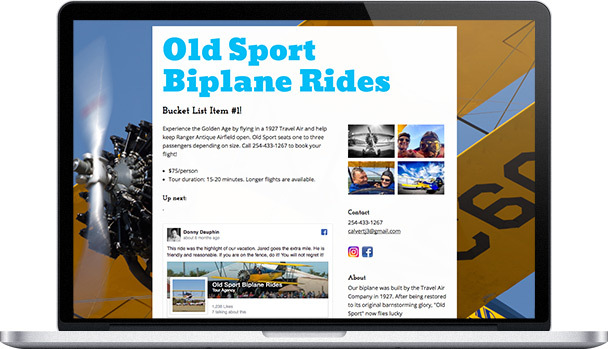 With their beautiful design and bold colors, Old Sport’s planes are works of art themselves, so it’s an excellent choice to center the site’s visual identity around them. They use various forms of photography—background image, photo galleries, and embedded Facebook posts—to showcase their rides while providing visual diversity. The background image makes you feel like you’re on the ground at the Ranger Antique Airfield—you can almost feel the wind on your face! And the vibrant yellow and blue paint, along with the backdrop of the blue skies, creates a lively color scheme that keeps visitors’ attention on the page. We also want to draw special attention to the way Old Sport also cleverly uses embedded Facebook reviews to both highlight its sparkling reputation as well as encourage visitors to engage on social media. If you hop on over to the Facebook page itself, you’ll see that these reviews aren’t just the best of many reviews—they’re representative of its spotless, five-star rating. In addition to glowing reviews, the Facebook page is full of photos, videos, and updates. Old Sport’s dedication to its audience and enthusiasm for its services shows prospective customers that they’re in for a stellar experience. 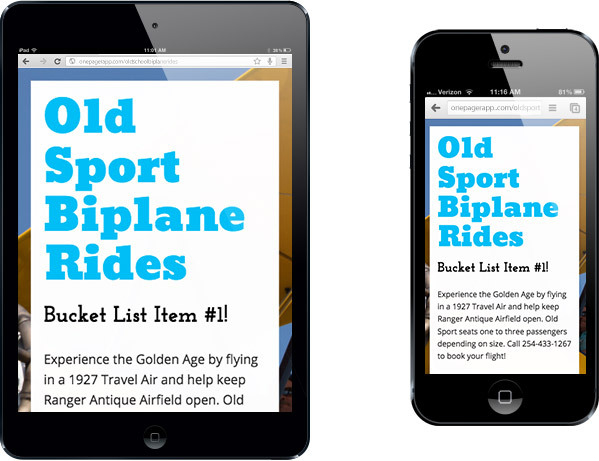 Congratulations, Old Sport Biplane Rides, on a site that soars to new heights!